What’s the Best American Express Card? With fierce competition between credit card issuers, American Express have had to up their game to compete with the new entrants to the UK credit card market. So with this in mind, we thought it was about time to look at the various options for the best Amex card available to UK residents. As regular readers will know, I recently combined the benefits of two of the best American Express credit cards to fly both myself and my other half First Class with British Airways from London to Sao Paulo. Yes, before you ask, it was incredible – you’re welcome to read all about it here. With the free American Express cards offering market-leading sign-up bonuses, ongoing benefits rewarding customers for spending on their cards and various other incentives, it’s no wonder there are a staggering 112 million cards in everyday use worldwide. Let’s take a look at some of the best Amex cards in the UK and try to work out which one may be best suited to you! Why use an American Express Credit Card? Best Amex Card UK – What are the Options? For those who are new to credit cards, the thought of signing up to a credit card to just earn a ‘couple of measly points’ (not my words!) or 1% cashback may not seem worth it. What if I told you that the benefits to some of these American Express credit cards add up to hundreds, if not thousands, of pounds? You’d be crazy to miss out on an opportunity like this and what’s even better is that the rewards are nearly always tax free! 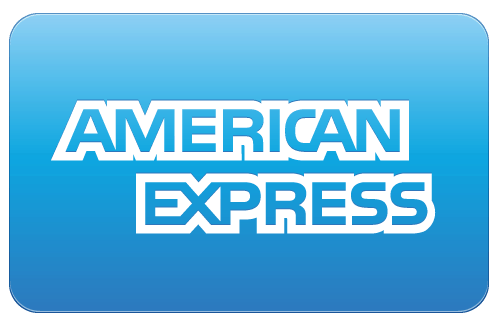 Ok, so before we jump into a run through of the best UK Amex cards, I thought it may be worth mentioning a couple of key points about an American Express issued credit card. The general rule is that you can hold up to 4 Amex cards at any one time. If you already have an American Express card you may not be eligible for the sign-up bonuses on other Amex cards if they fall within the same card category. I’ve picked these out later in this review. 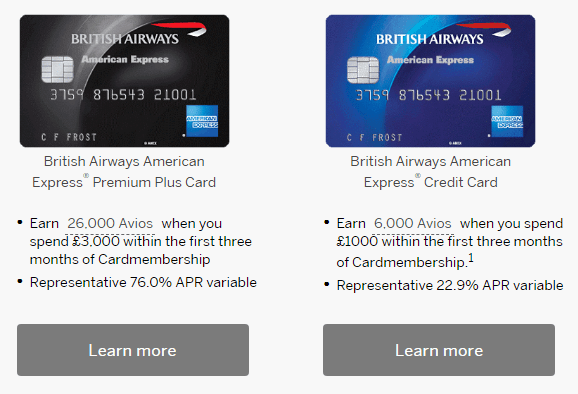 For the avoidance of confusion, if you hold say the American Express Gold Card you can sign up for the British Airways branded American Express and still receive a sign-up bonus. You can’t however sign up to the American Express Platinum and still receive a sign-up bonus. The minimum amount of time between cancelling a card and signing up again to receive the sign-up bonus is 6 months. Some cards issued by American Express are charge cards, which means they need to be paid off in full each month! If you’re not planning on paying off the card in full each month then the high interest rate American Express cards are unlikely to be the best credit cards for you. With 10 cards issued directly by American Express, you’d be forgiven for not having the faintest idea about which is the best American Express card to sign up to! Don’t worry… we’ll run through each of the cards and analyse why they may offer good or bad value for customers. The entry level American Express card (in green) is… well quite simply terrible. With an annual fee of £60 and a sign-up bonus of a mere 2,000 points if you use this link (and scroll down), only the ongoing earnings rate of 1 point for every £1 spent is similar to the alternative Platinum or Gold cards. Amex Gold (reviewed here) – with the current promotion, the American Express Gold card is free for the first year, saving new customers £140 (although most people tend to cancel the card before the 12-month period is up, which is wise!). You’d ordinarily earn a strong sign-up bonus of 20,000 points for spending £2,000 in the first 3 months – note the 22,000 points mentioned above only applies if you use this link. With a redemption value in the region of 0.5p to 1p per point, this sign-up bonus could be worth as much as £220! This, alongside the 2 free lounges passes and travel-accident cover, make it one of the most popular and best Amex cards on the market. 30,000 sign-up bonus when you spend £2,000 in the first 3 months. This can be increased to 35,000 points as seen above by using this link (scroll down to the correct card) and could be worth as much as £350! Priority Pass providing complimentary access to the holder and a guest to over 1,100 airport lounges. Whilst this would cost £369 to purchase through the Priority Pass website (and you’d have to pay extra for a guest), I estimate this to be worth in the region of £200 a year. This will vary depending on how many times and how much you’d be prepared to pay to visit an airport lounge. Free hire-car accident insurance (with no excess!). This saves me about £40 per year. Complimentary lounge access when travelling with Eurostar. Ongoing earnings rate of 1 point for every £1 spent on the card. Whilst the entry-level, free British Airways credit card is one of the most publicised methods of collecting BA Avios points it’s also one of the worst. 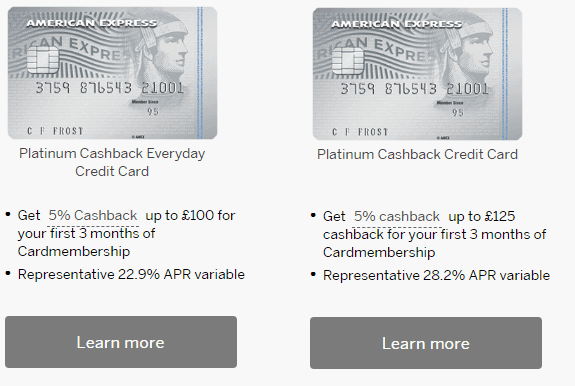 Let’s take a look at the two American Express credit cards offered by British Airways – again the sign-up bonuses mentioned below only apply if you use this link and scrolling down to the correct card. 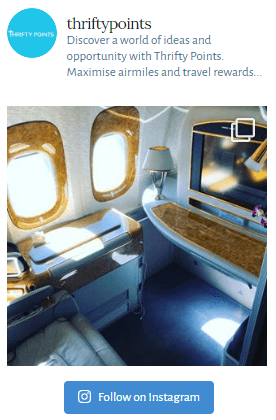 BA Amex (reviewed here) – One to avoid, but why? As you can see, the sign-up bonus of the BA American Express (usually 5,000 points) lags behind the alternative, free American Express (Gold) by some 16,000 points. American Express Rewards points can easily be transferred to Avios at a rate of 1:1 and as such you’ll be missing out on a huge number of points and the complimentary lounge access if you choose the BA Amex over the Amex Gold card! BA Premium Plus Card (reviewed here) – Similar to the Platinum card, the annual fee of £195 deters some people from signing up to this card. HOWEVER, this card offers one of the most valuable… actually the most value credit card reward in the UK market. If you’re able to spend £10,000 on the card in a 12-month period you’ll receive a 2-4-1 reward flight voucher. With the benefit of being able to fly two people for the same number of reward points as one ticket you can save anywhere up to 200,000 Avios points with this benefit. As I mentioned earlier, I recently combined the 2-4-1 voucher with 100,000 Avios to fly two people First Class with British Airways from London to Sao Paulo. With a value in the region of 100,000 Avios in this instance and the value of an Avios broadly in the region of 1p per point (read how I value an Avios here), this benefit was worth roughly £1,000 in this instance! You’ll also receive 25,000 Avios points (26,000 using this link and scrolling down to the correct card) when you spend £3,000 on the card in the first 3 months. With two American Express cards offering cashback, which is likely to be the best Amex card for you to earn cashback on your daily spending? The Platinum Cashback Credit Card comes with an annual fee of £25 which is offset by the £25 sign-up bonus if you use this link and scroll down to the correct card. You’ll receive 5% cashback up to £125 (rather than £100 with the Everyday card) which will again offset the £25 annual fee. You’ll also receive an ongoing cashback rate of 1% up to £10,000 and 1.25% on anything above! Similar to the Amex Gold Card, the Business version offers a sign-up bonus of 22,000 points if you use this link (scroll down to the correct card) and spend £3,000 in the first 3 months. The annual fee is also waived in the first year, making it attractive to small businesses and start-ups. The Platinum Business Credit Card comes with an even larger sign-up bonus of 40,000 points (increased to 45,000 points by using this link and scrolling down to the correct card) however the spending threshold is significantly higher at £6,000 in the first 3 months. You’ll also receive all of the many benefits offered by the personal Platinum card which may potentially offset the £450 pa fee! The final two cards I’d like to touch upon are the Starwood Preferred Guest American Express and the Nectar American Express Credit Card. The Nectar Credit Card rarely makes an appearance here at Thrifty Points although that’s not to say it doesn’t provide value for money for customers. The card comes with an annual fee of £25 however this can be offset by the 20,000 Nectar points sign-up bonus when you spend £2,000 in the first 3 months. This can be increased to 21,000 points if you use this link (scroll down to the correct card) which is worth £105 if spent with any Nectar partner (essentially 0.5% cashback). You would however be better off with the cashback card, which provides more flexibility over where the money can be spent! The final card is the Starwood Preferred Guest Credit Card which provides a sign-up bonus of 33,000 SPG points (using this link and scrolling down). Don’t be fooled though, with an exchange rate of 2 American Express Rewards points to every 3 SPG points you’d be receiving the equivalent bonus to the Amex Gold Card. You would however have to pay the annual fee of £75 from the start! If you’re new to collecting points and would like a free card, then look no further than the American Express Gold Card (reviewed here). The 2 complimentary lounge passes and very generous sign-up bonus of 20,000 points, which can be increased to 22,000 points using this link, makes it by far our favourite card for those who are new to credit cards. Now there are likely to be two options here. The first and simplest option would be the American Express Platinum Cashback Card. You’d receive between 1-1.25% on all spend (with a bonus of 5% up to £125 in the first 3 months) and the annual fee of £25 could be offset by the free £25 offered using this link and scrolling down to the correct card. The second option would be combining both the American Express Gold Card and the British Airways Premium Card to earn enough points for two First Class transatlantic flights – read my First Class review here which provides a step-by-step guide as to how this can be done for less than the price of an economy ticket! Recent changes to American Express rules now mean that to qualify for the sign up bonus on certain cards you cannot have held a personal American Express in the last 24 months. Fortunately you can still sign up and benefit from the bonus of the Premium Plus card if you hold a Gold Card. The same is not true in reverse. If you already hold a Premium Plus card you will not qualify for the sign up bonus on the Gold card. As such always sign up to the Gold Card first and then the Premium Plus card second – learn more about the sign up bonus restrictions and our suggested strategy here. Again there are two options you could choose here. The Starwood Preferred Guest American Express Card would seem like the obvious option but comes with an annual fee of £75. You’d earn a reasonable sign-up bonus of 33,000 points using this link and scrolling down to the correct card. You’ll also receive Gold SPG status. But don’t forget that it’s also possible to transfer the membership points earned with the American Express Gold card which would equate to 33,000 points at a rate of 2 reward points to every 3 SPG points. This card is also free for the first year! 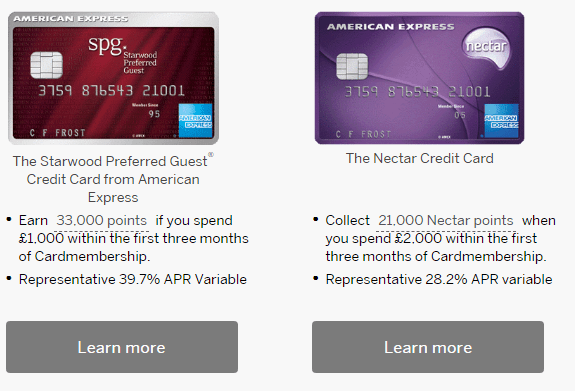 Alternatively, the Platinum Card offers hotel status with numerous brands and a market-leading sign-up bonus of 35,000 points if you use this link and scrolling down to the correct card however you’ll need to do the maths to determine whether the various perks offset the whopping £450 annual fee of the card. We hope you’ve found this article helpful and that we’ve given you some inspiration as to which may be the best Amex card for you. As always, please do reach out if you have any questions or comments.